-Carkner dominated early and looked like he caught Godard with one huge right but Godard rebounded and landed a few rights of his own before getting Carkner to the ground. Godard appeared to have gotten hurt. -They actually didn't even get fighting majors for it because Foligno's teammates jumped in before Engelland could even get started on him. Don't even know what Foligno was thinking in engaging in the 1st place. -Godard and Carkner go at it right off the bat after a bit of a chippy first few minutes. -Buzz line comes out for a solid shift 4 minutes in but can't generate any scoring chances. 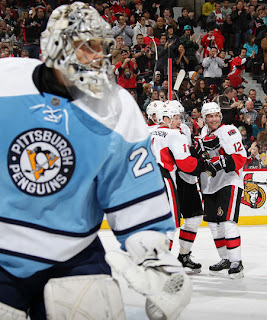 -Chris Phillips smothering Crosby all period so far. -Bylsma shifting the lines. Malkin out with Conner and Letestu. -Kunitz takes a late charging penalty with 20 seconds left in the period. It was a horrible call, in fact, because Kunitz was gliding long before he made contact with his man. Sens PP carries over. Notes: Pens were not ready for this one at all. 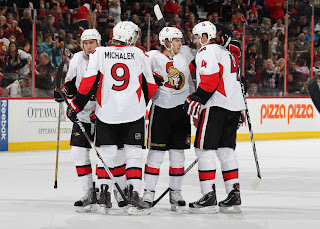 Sens had the extra step on them all period long. Easy to see how this transfers to the 2 Ottawa goals, as the penalty killers were just outworked by the passing of the Sens. Pens only got 6 shots all period long and none of them were quality. Why? Don't know for sure but a possible explanation is that it's hard to play a road game the day after a holiday because of a different travel and practice schedule. Nonetheless, no excuse for the sloppy play. -Crosby line comes out looking desperate. Solid shift and the momentum starts to shift the Pens way. -Letang and Spezza battle on the boards. Spezza loses his balance and hits the boards awkwardly. Ottawa jumps all over Letang. Spezza leaves the game holding his wrist. Letang sent to the box (they penalized the result not the hit) and so is Shannon for jumping him. 4 on 4. -Scrum. Engelland and Foligno come out of it engaged with each other. 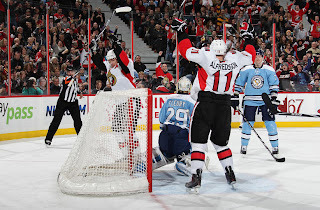 Sens panic (Foligno is nowhere near a fighter of Engo's caliber) and jump in to protect him. 3rd man in called on Phillips. Pens get PP but look awful. -Godard (don't even know how he managed to get back on ice) wants a rematch with Carkner midway through the 2nd. Carkner wants no part of it. Godard slapped with 10 min misconduct. -2 headed monster out at the 11 minute mark. Probably the best shift of the night and the Pens come close to scoring when Crosby hit the post but no dice. -Ruutu starting trouble and going after Letang. Pens PP. -Sens get shorthanded 2 v 1 rush. Crosby defends his man well, but then he dives and Sid is sent to the box. -4 on 4. With 14 seconds left in the period Malkin steals the puck in the offensive zone. Elliott stops the original shot and then Kennedy's rebound attempt for his 22nd save of the period. Notes: Apart from that first PK, the Pens really controlled this period. They dominated the possession and shots (22-6) but couldn't generate the type of quality shots needed to beat Elliott. Malkin/Kennedy's last chance and an earlier opportunity by Craig Adams were the only real quality opportunities and you need more than that to beat a goalie having a hot night. Also the game really started to get nasty in the 2nd. Pens like to play physical hockey, but not nasty. 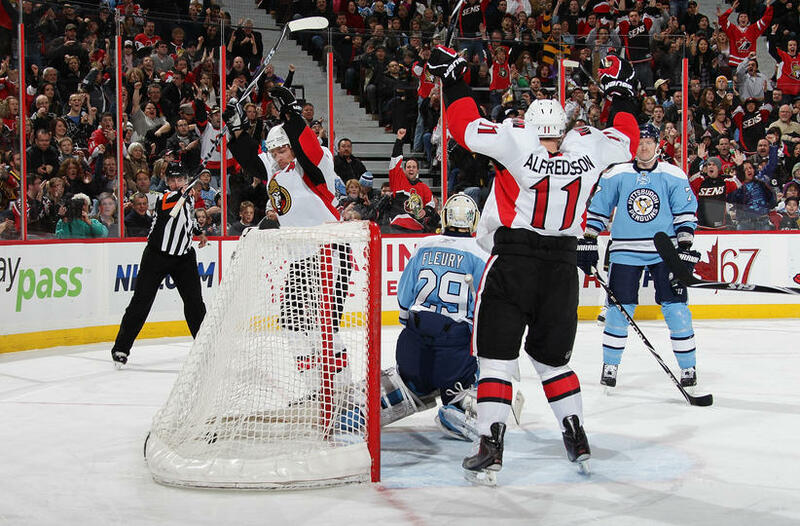 Chris Neil and Jarkko Ruutu's dirty play didn't allow the Pens to build much momentum after they had a good shift. -Buzz line 3 once again clocks in a solid shift early in the period. -Bylsma again toying with the lines. He had Crosby and Malkin out there with Rupp. I don't know if he did it to protect his superstars so they could generate offense or just being cautious of a hostile game but it was certainly an interesting move. -Foligno gets past Orpik and Letang at the 9:30 mark and it's off to the races. Orpik gets him from behind (penalty shot) but he still gets the shot off. Fleury bobbles it and it trickles on the goal line before Orpik scoops it out. Replay was incredibly close and even the highest level of zoom still couldn't generate conclusive proof either way so it was called no goal. Personally, I thought it was a goal but I'm not complaining. -On the penalty shot itself, Foligno put a good deke on Fleury but Flower recovered in time to stuff his backhand. SAVE. -Pens unable to capitalize on the momentum yet again and things get ugly. -Ruutu takes a run at Talbot. Neil and Cooke get into shoving match. Only Ruutu and Cooke are sent off. -At this point (7 min to go) it looks like the Pens have abandoned all hope of a comeback and are simply trying to set up Sid for the streak. No hustle by any other line or the defense. -Sid finally breaks through on a fluky shot that deflects off Carkner before trickling behind Elliott. 3-1 and all of a sudden the Pens have life. -Fisher called for tripping 7 seconds after the Crosby goal and the Pens go to work on a 6 v 4 powerplay. -Pens generate many shots in the final 3 minutes but simply cannot beat Elliott. PENS LOSE 3-1. Notes: Again, the Pens picked up the effort but just couldn't get their game going the way they like to. Bylsma shuffled the lines quite a bit and the entire motif of the period shifted to extending Sid's point streak. Once that was accomplished, the Pens put in a mad effort to score the other 2 but it was too little too late. -I always tell myself that the Pens have many more dimensions than Crosby, but tonight the Pens were flat when Crosby was flat and the team picked up when Crosby picked up. That is dangerously similar to OV and the Caps, but hopefully it was just a 1 night thing. -The Pens should recall Jeffrey again if Asham can't play because Godard is not getting the job done. He is on the team solely for the purpose of fighting (and Engelland has clearly surpassed him in that category) and if he is going to take stupid penalties than he is just dead weight. -3rd line continues to generate energy. -Goligoski needs to work on his defense. He looks confused out there sometimes. -I'm going to bring back the old "flip the switch" metaphor. The Pens just couldn't flip it in time tonight. "It's just a matter of how we're going to play the game and our mentality going in and in the first we didn't look to execute too much"
-That bogus boarding call on Kunitz eventually lead to the Sens 3rd goal. Not making excuses for a poor PK, but still that was a huge moment in the game. If anyone was looking forward to the Caps postgame, I apologize. There was certainly plenty to say, but computer problems prevented me from getting the post up. Let's Go Pens!